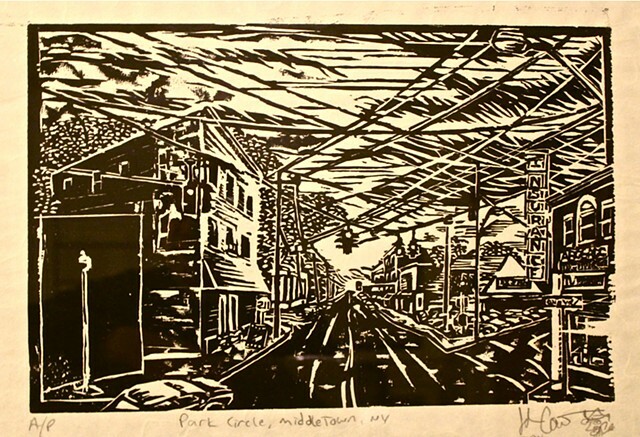 I moved upstate from NYC in 2001, and I fell in love with crumbling, old Main Street scenes, of which there are many, unfortunately, outside the city. This is a street I drove down very often, and I was struck by the crazy angles the 5 corners creates, and all of the overhead power lines, which are long gone from NYC. As I stopped to take photos, I was looked at very suspiciously by a few people. I figured because this was because I was standing in the middle of a busy intersection in the rain, taking photos. When I finished the piece and showed it to people, they were shocked that I would bother to do a portrait of that intersection because it was a notorious drug spot. I just thought it looked cool.